Bob is a member of the Columbia Center Rotary Club in Kennewick, Washington. He joined the Columbia Center Club in July 2005 and has served as Director, International Service; Secretary, Treasurer, President Elect, President in 2015-16, and Past President. He also has served as District 5080 Assistant Governor for Area 10 in 2016-17. He has participated on three International Service projects trips to Mexico and one to Chile. A native of Alderwood Manor, Washington, Bob enlisted in the U.S. Navy in September 1965. He achieved the rank of Electronics Technician 2nd Class (E-5). While on assignment at Coronado, California with Beach Jumper Unit One he saw duty in Vietnam and was awarded the National Defense Service Medal, the Navy Unit Commendation Medal, the Vietnam Service Medal with one bronze star and the Republic of Vietnam Campaign Medal. Bob worked for 24 years for Energy Northwest in Richland, Washington. During this career he served as Information Services Analyst, Software QA Lead, Supervisor of Plant Support Group, Manager of the Calibration Lab, and Manager General and Technical Support Training. He is a Certified Professional Manager through James Madison University. Bob served on the Kennewick City Council for four years and was Mayor of the City of Kennewick for two years (1992-93). 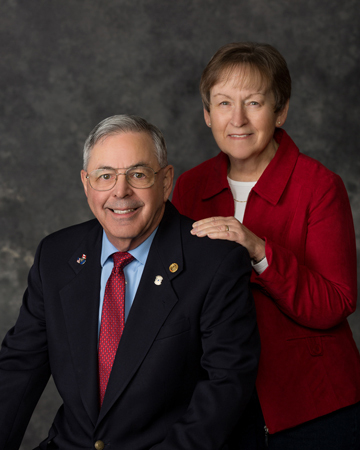 Bob met his wife Carolyn in 1970 while they both were working for an aerospace company, ELDEC. They have been married for 46 years and have 2 children, 6 grandchildren and 10 great-grandchildren.